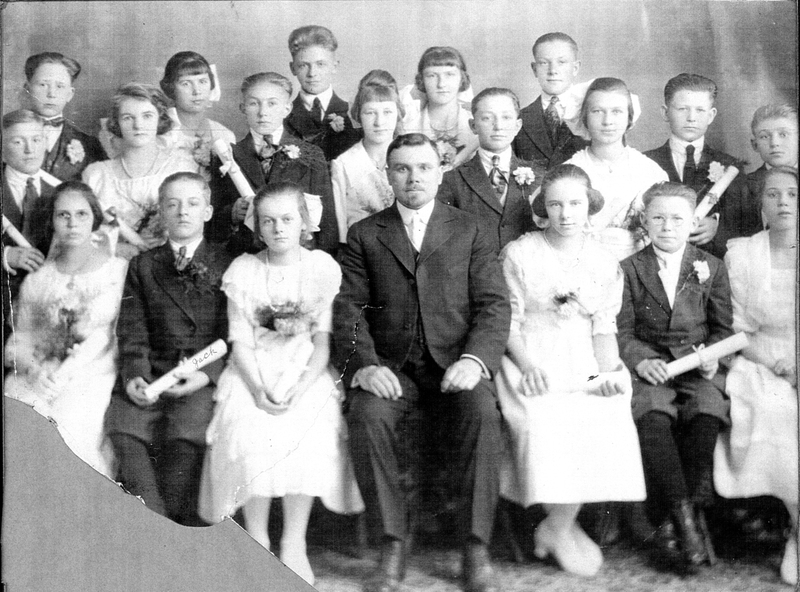 The Second German Congregational Church Confirmation Class of March 20, 1921. Front row from left to right: Amalia (Lydia) Schafer, Jacob (Jack) Hagelganz, Elisabeth (Betty) Leichner, Rev. Heinrich Hagelganz, Amelia Schmer, Alexander (Alex) Kuhn, either Katharina Keller or Amalia Reusbich. Middle row from left to right: Heinrich Schneider, Lesly (Leslie) Weidenkeller, Elisabeth (Betty) Miller, Alexander (Alex) Spreier, Amalia (Mollie) Schneider, Walter (Walt) Schreiner, Katharina (Katie) Bihn, Walter (Walt) Fritzler, John (Johnny) Holzer (Helzer). Back row from left to right: Edward (Eddie) Weitzel, Lydia Kuhn (Kuehn), Friedrich (Fred) Schwan, Amalia (Mollie) Schneider, Henry Krieger. Most of the class members in this photo were identified by Walter Fritzler who wrote their names on the back of his confirmation photograph. If the names written by Walter Fritzler varied from those in the church records, his variations are shown in parenthesis. This information was provided by Walter's son, Walter Keith Fritzler on August 29, 2013.